Either 1 tablespoon honey OR 2 tablespoons of date paste* see below as a sweetener. 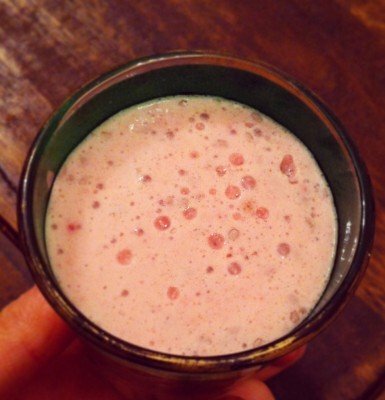 Put the strawberries, milk, date paste and vanilla into into a blender. Whizz on high speed until it’s all very smooth. Turn off the blender and add the chia seeds. Pulse 2 seconds only to mix in the chia seed. Let sit about 10 minutes for the chia seed to gel and swell before eating. Sometimes I make it one day and eat it the next for breakfast. It’s still lovely. The chia seeds swell and become gelatinous, yes still have a crunchy centre. It’s a bit like caviar in texture. This can be served with edible flower petals, fresh fruit or just as it is.